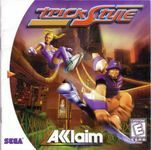 TrickStyle is a video game released on September 9, 1999 for the Dreamcast and PC, developed by Criterion Games and published by Acclaim. The game was originally going to be on the PlayStation (console). The idea was soon rejected, when Criterion realised that it had limitations. The game is set in the future and based around the sport of Hoverboarding. The player can race or do stunts through metropolis versions of London, Tokyo, and Manhattan Island, or in a massive practice arena called the Velodrome. The game features nine boarders to ride on the hoverboards: They are Angel, Brad, King, Uri, Max, Mia, Rose, Shin, and Zak. Each has their own riding style, special moves, and board preference. Source: Wikipedia, "TrickStyle", available under the CC-BY-SA License.